I Dig It, a $3 game from InMotion Software with a free lite counterpart, is a beautifully-drawn and very popular game in the App Store. The game’s storyline certainly feels reasonable in today’s economy: You need cash, and you’re tasked with digging underneath a farm to find various gems—referred to in the game as diggins—to make the mortgage each month. Along the way, you can use extra cash to buy newer equipment and tools. Your digger is a (heavily) modified bulldozer. As with I Dig It’s visuals themselves, controlling the digger is a thing of beauty. There’s an on-screen joystick on one side, and a series of gauges to monitor on the other. (The game cleverly offers a left-handed mode so that southpaws can play conveniently, too.) Sliding the controller moves your digger in the chosen direction, and you can even propel it upward through already-drilled pathways. I’ve never liked a virtual joystick on the iPhone as much as I like this one. It’s smooth and responsive. Those gauges are exceedingly important, too: You need to keep an eye on your fuel level, temperature, and overall damage; let any of them get too far in the red, and it’s game over. You’ll need to slow down your drilling to keep from overheating, and things get even hotter the deeper you get. As you suffer hull damage or run low on gas, you’re forced to rocket back up to the surface to pay for repairs and upgrades, or top off the tank. And there are tons of upgrades. You can buy more powerful drills, strengthen the digger’s shell, and even buy dynamite to blow up rocks that are too tough to dig through. Of course, each upgrade comes with a cost, and when you need to make a mortgage payment, every penny counts. Much of the fun in I Dig It stems from keeping those levels under control, coupled with strategizing the best path to secure the most diggins with minimal wear and tear. The bank’s coming to repossess the farm in just four hours, so you need to scour for maximum pillagings, as efficiently as possible. (You’ll need to earn $100,000, which is no small task—retrofitted bulldozer be damned.) 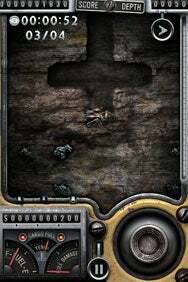 The deeper you dig, the more valuable the gems you’ll discover… But of course doing so uses more fuel, incurs more damage, and takes more careful planning. This “campaign mode” is surprisingly deep, and continued mastery takes a long, enjoyable time. Impressively, I Dig It adds to its offerings with a robust set of built-in mini games. Challenges like scoring 100,000 points within 15 minutes, or exploring all over until you can find a spare tire, are as fun as the main game. And some, like finding 100 coins in an underground maze before times run out, I actually even enjoy more! I Dig It Lite offers a scaled-down version of the game’s main campaign. It’s fun, but I urge you to cough up the cash needed for the pay version to unlock the full game, the challenges, and “free play” mode. Together, those varied modes make I Dig It a remarkably feature-laden game that’s packed with replay value. Both versions of I Dig It are compatible with any iPhone or iPod touch running the iPhone 2.x software update. Updated to reflect a pricing change to I Dig It as this review was published.